How supportive are lumbar pillows? The term “lumbar” relates to the lower part of the back, where the loins or the vertebrae between the thoracic vertebrae and sacrum are. In lieu of a scientific illustration, the lumbar region is the part of the lower spine area that bulges inwards above the tailbone. Because the lumbar region is the part of the spine that curves inwards the most, it is easily prone to pressure thus causing lumbar pain or more commonly known as lower back pain. Prolonged periods of sitting down cause much stress on the lumbar region and we feel it through aches when we stretch or get up. It was for this reason that lumbar support pillows were invented. Lumbar support pillows used to be available for office chairs only since it was the main source of lower back pain incidents. More and more, companies started looking for other niches that they could introduce lumbar support to and found another activity where we also sit down a lot for: driving. Today, there are numerous kinds of lumbar supports available that cater to your specific needs. The main job of a lumbar support pillow is to provide comfort while maintaining proper posture so that there will be less pressure being placed on your lumbar region and thus, less pain. If you have some free time, do try to take a look at the shape of your car seat. Most often than not, there is a hollow area at the lower part of the seat which illogically does not meet the inverted C our bodies make when seated. To compensate and to try and fit snugly into the car seat, we tend to slouch, which is a big no-no. Enter auto lumbar pillows. 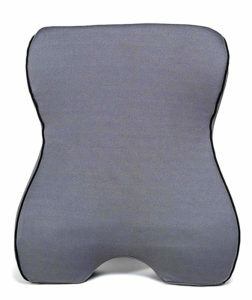 The photo above is the general way a lumbar pillow is shaped and where it is supposed to go on the car seat. Support is maximized when you take your seat. 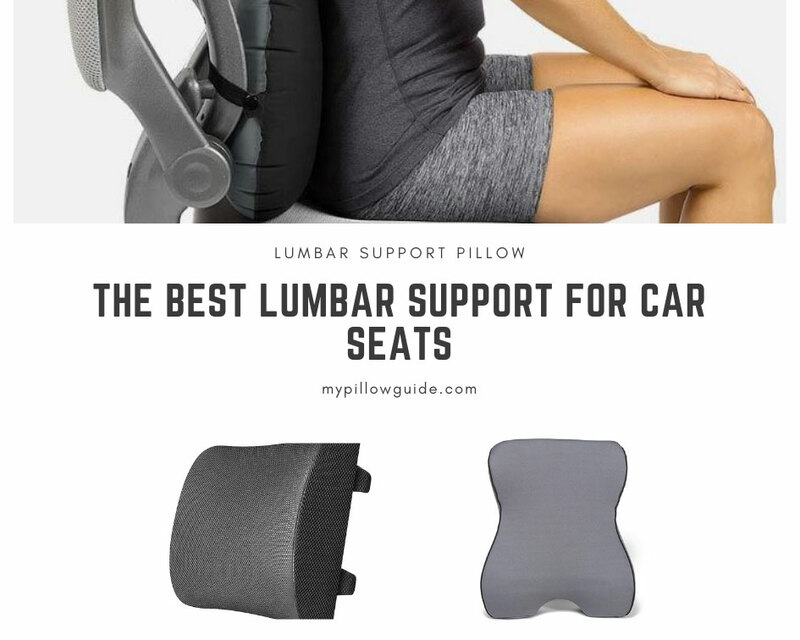 Auto lumbar pillows offer lower back support by being attached to your car seat to provide extra cushioning for a pleasant and comfortable ride. Lumbar pillows for cars are a great investment because they offer a lot of benefits. First and foremost, lumbar pillows were created to give support. They help align your neck, back, and hips as you sit down. Without a lumbar pillow supporting your back, you will end up slouching or straining your back as you drive. It may not seem obvious at first, but long drives without any support will result to back pain. They’re not too hard and not too fluffy, the best lumbar pillows are made just right to give you optimum comfort. Because let’s face it, somehow car manufacturers just don’t make the seats perfectly, which, in a way, is a smart choice because our backs and body frames are shaped differently and they must produce cars that can accommodate all clients. We all know how difficult it is to constantly be implementing proper posture while sitting down. It is an activity that must be done consciously while the temptation to slouch is constantly there. When driving, you cannot allocate much attention to remembering to sit up straight. Lumbar pillows are there to help. They automatically push you to sit up properly and exercise proper posture. With good posture comes less pain. Isn’t that great! Less medical costs! No more trips to the doctor for lower back pain, or constant massage sessions which are both expensive. Auto lumbar supports decrease fatigue levels which heightens concentration. Furthermore, it promotes better head motion that increases vision capabilities and easier breathing because of proper posture. All of this help ensure your safety as you drive. Good quality lumbar pillows for cars only cost around $20! You do not have to shell out a hundred bucks to get the benefits mentioned above. These pillows are very easy to use and don’t come with a long manual to study before setup. They can easily be installed onto your car seat with no fuss and confusion. Most lumbar supports come with a strap or buckle to be attached to the seat. Lumbar pillows are available in many different angles in order to provide proper support for the issue and each one has its own unique features. There are some things to consider in making sure that you choose the right lumbar support for your car. 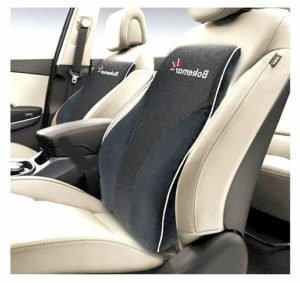 Universal fit – A lumbar pillow that is made to fit all car seats is usually the best way to go for easy installation. 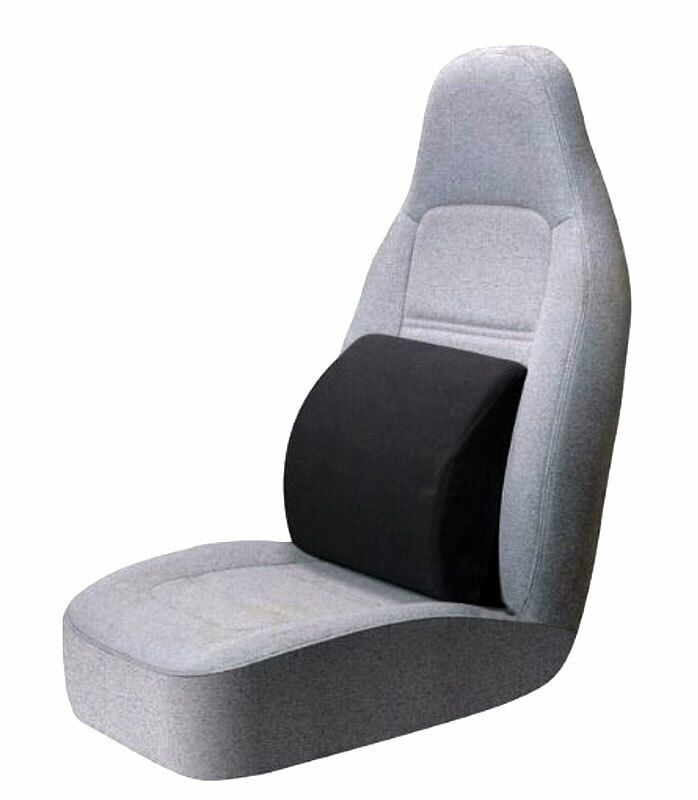 If you find a lumbar pillow with specifications and includes car models, even better. Contour design – There are lumbar pillows that are concave-shaped and curve inwards and there those that bulge out in a convex shape. They also come in different sizes, therefore it is advisable that you personally pick out the pillow that will cater to your needs. Ventilation features – To avoid any heat build-up behind your back, get an auto lumbar support with good ventilation that improves airflow. This will increase comfort during use and long-term performance and durability. Ergonomics– Probably the most important of all considerations are the features of the pillow that you are looking for in lumbar support. A good ergonomic fit will ensure that the pain or issues you are trying to address will be fixed. 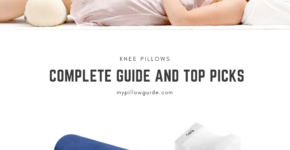 Now that we know what lumbar support pillows are and what they can do, I’ve gone on ahead and made extensive research on picking out the best lumbar pillows available in the market. To further enhance my decision-making on which pillows should make my list, I also looked at the reviews. Real people giving their actual experiences with lumbar support is a great way of assessing the functionality of the product. I’ve included two reviews for each pillow. Named after the largest castle in the world located in Poland, the Bulwark Knight Back Cushion is here to make you feel like royalty as you sit on your throne. “I drove from Atlanta to Jersey City, my back felt like it never took such a long ride. I sit around the house with it. Really like it” – Amazon customer. Can you imagine? That 859-mile drive seemed like nothing for the satisfied Amazon customer. If you think this pillow is the one for you, click this link for more information on the Bulwark lumbar support pillow. Customer Randi absolutely loves his Bulwark pillow. He uses it everywhere! Uncomfortable chairs are not a nightmare anymore for those with bad backs, thanks to this lumbar support. He finds the drawstring bag convenient as well, making the pillow a good companion on his errands. Want to feel as good as Randi? Head on over to Amazon for more details. 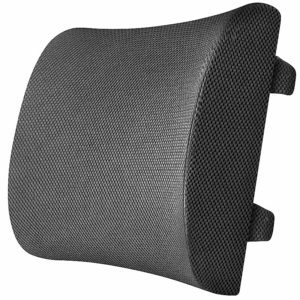 Next up is a simple-looking lumbar support pillow that is concave-shaped. Everlasting’s lumbar support is therapist-approved! This particular brand has excelled above others, from the memory foam to the double straps and removable cover. The therapist who gave the review now feels good after long commutes instead of aches and pains. Look here for more on the reasonably-priced, must-have, comfortable lumbar support by Everlasting. Want to know how effective Everlasting’s lumbar support pillow is? According to the joyfully retired customer below, back pains were immediately eliminated! The reviews on the product were all praise and amazement. Specifically used on a Subaru Outback, we now know that fits mid-sized SUVs. If you want to make your purchase now, let me redirect you here. It may look like a spaceship pod, and rightfully so because this next lumbar support will give you an out-of-this-world driving experience. Ms. Julie Russell below is always on the road for her profession and relieves her back pains with Bokemar’s lumbar support. She even gave a pros list of the product. If you are convinced that your car needs this as soon as possible, click the following link which will redirect you to Amazon. “I use this in my car because I’m a delivery driver. I’m in the car for hours at a time. I was having lower/middle back pain. Since using this product, the pain is much better. If you are like Paul West, the next reviewer, and you experience chronic back and hip pain, then Bokemar lumbar support might be your miracle in a pillow. Dreading being seated for long periods of time or sitting on uncomfortable seats because of the pain? Alleviate all anxiety and click the following link for more information and reviews on this product. Sad to say, but because we spend too much time sitting down, we are all the more prone to aches and pains. Although, it doesn’t mean that we must remain as slaves to the sharp pain, temporary immobility and groaning while standing up caused by staying seated for long periods of time. I personally consider the perfectly designed, soft yet sturdy, comfort-giving inventions called pillows to be heaven-sent. And now, we can have a little piece of heaven while we go for a drive. Hope to see you all again here at My Pillow Guide! Wow, this is what I have been looking for , the lumbar pillow support. I tend to travel alot due to the nature of my job and it is most by road so I take my car on most of my trips for convince. This recently has had a great effect on my spine sometimes my entire back line as I get severe pain on my waistline after 6 hours of driving none stop. I would most times on weekends go get a massage but for how long. This looks like a preventive measure and it is what I need . I get myself one. Thanks for this post,it’s been helpful. Lumber support pillows are marvellous, not just for in the car but also at home, office or workplace. You’re right in that we do put a lot of pressure on our spine in every day activities and we don’t always sit correctly so long hours slumped in a bad sitting position, it’s enevitable that we will suffer the consequences. I like that you have offered reviews and info on several different supports to try. Thank you for your research and subsequent information . This is a great, informative and educative article. Lumbar support are meant to correct poor posture which has resulted in doctors treating an alarming number of patients with lower back pain. You have put everything in perspective for anyone reading this post to understand all about “The Best Lumbar Support”. From why lumbar pillows are the bomb, to Choosing the right lumbar pillow for you to how supportive are lumbar pillows?” You can’t possibly be more exhaustive. I have been a professional massage therapist for over 15 years. Most of my clients have problems with either their neck or their lower back (the lumbar part). Always before we start a session, I have a habit of asking about the lifestyles of my clients and, in particular, their motor culture.In 80 percent of cases, I found that the pain, especially those with pain in the lower back, is not due to the disease but to the wrong posture. Therefore, as a preventive measure, I recommend a correction of the posture, either by physical exercises (fitness, yoga, etc.) OR by selecting appropriate support. The lumbar pillow is one of these stuffs than can help us. Because we spend a lot of our time in the car, the comfort of the body is of particular importance. That is why the lumbar pillows are an indispensable assistant in the fight against the pains in the back and neck (some of the pains in the neck and head comes directly because of problems with the lumbar part).